Family owned and operated, Berry Brook Farms is located in Rural Abbotsford, close to the Abbotsford Airport. 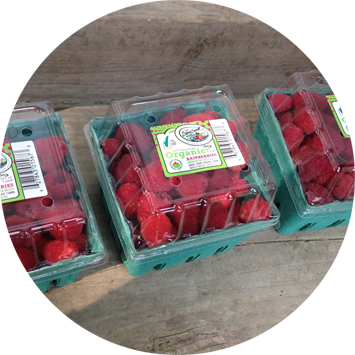 We started in 2003 with a small field of organic raspberries. Since then we added 4 more fields which now include organic blueberries, strawberries, and blackberries. Many years of good crops and bad crops, new varieties, field experiments, and new farming methods, all added up to invaluable experience and the knowledge we now have to produce a high quality, great tasting, consistent product. We sell fresh and frozen product at the farm gate, as well as wholesale. Since organic fresh fruit is much more perishable than conventional fruit, we always hand pick the fruit the same day we sell it. This requires having the orders in the day before pickup. Organic farming means we don’t use any conventional fertilizers, pesticides, herbicides, or fungicides. But it also means a lot more. It means encouraging a balanced eco system. This includes adding organic matter back into the soil, applying compost and mulches, using cover crops, etc. This all encourages a healthy plant. Not using any conventional insecticides helps maintain the natural predatory insects in the field to help combat the bad insects. We use natural methods where we can, and the rest we substitute with hand labour. Lots of it! Spring time is planting, weeding, and mowing, summer is hand harvesting, fall is more planting and weeding, and winter is pruning.